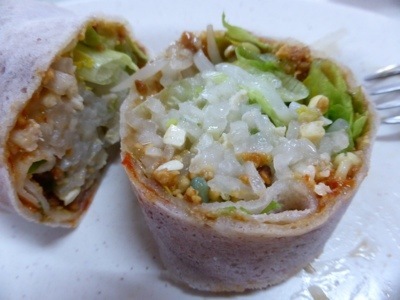 Before my flight back to the Boo, my friend S insisted that I should sample what she claims to be the best Popiah in Kuching. The coffee shop is somewhere along the 3rd Mile – the name escapes me – but she was kind enough to give me the directions should I want to visit the place in the future: “Opposite KTS village apartments, behind ‘Rice n Noodles’ shop. Few doors away from Hainan Cafe”. Goobledygook to me, but perhaps might make some sense to the Kuchingites who are familiar with the landmarks. 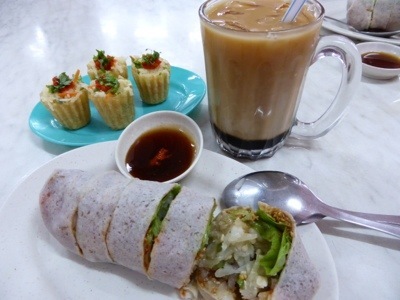 Our vegetarian breakfast consisted of 2 popular Nyonya snacks – popiah and pie tie. By the way, Nyonyas are Chinese women married to Malay men. Their descendents of this mixed-racial marriage are called Peranakans. Nyonya delicacies often involves a lot of work – julienning, dicing and pounding the vegetables or herbs. The vendor of the popiah store is Joseph, a man in his 60s. What made his popiahs special were that the thin flour pancakes are stuffed with the julienned wholesome goodness of jicama, long beans, bean sprouts, cabbages and chopped up dried bean curds given a dash of life with sweet crunchy peanut and chili sauces then tightly rolled into a tight package as big as a burrito roll with a hefty tag of RM3. Being purely vegetarian, they were packed with minerals, vitamins and fibres. the notable thing about Sarawakian popiahs are that the ingredients used are all dried. In this case, the jicamas have been been steamed then squeezed dried. Now, you may be wondering what is ‘Jicama’. It is also referred as Mexican yam or Mexican turnip. It is a large brown bulbous root. Inside the rough and tough skin is the white crunchy flesh, similar to a raw potato but wetter and crunchier. The flavor is slightly sweet, a little nutty. It can be eaten both raw and cooked, although my own favorite is raw, (a key vegetable in rojaks) since its crispness and colour can be retained over time. 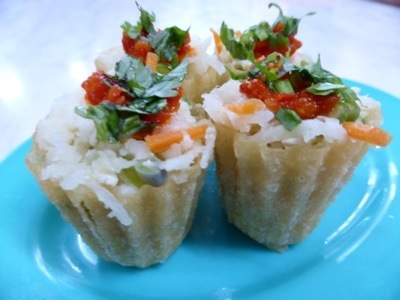 Kuih Pie Tee or ‘Top Hat‘, thus called due to the thin crispy shell casings when inverted look like a lot like a top hat. 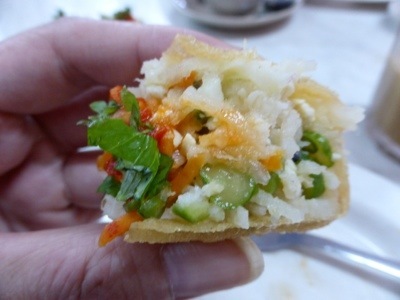 This crispy shell is usually filled with the same mixture of thinly sliced vegetables that popiah uses. Considering that making the little top hats is tedious work, it commands a premium of RM1 each. This is a popular Peranakan tidbit, something to amuse the mouth. I have been seeing advertorial posters of an interesting drink called ‘3 Layer Tea‘ adorning walls in nearly all the coffee shops I have eaten at but had never ordered. 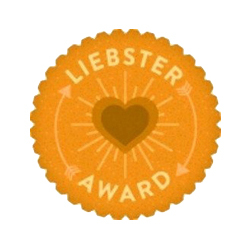 Today, I decided to order one too. The 3 layers of my iced 3 layer tea consisted of black palm sugar syrup at the bottom, creamy evaporated milk in the middle and brown brewed tea on top. It is a distinctively coloured drink when carefully layered. The sweetness has a refreshing pandan leaves fragrance to it which I enjoyed. It was a good wholesome breakfast which I appreciated. So, thanks again S! This entry was posted in Coffee Shops, Kuching, Malaysia and tagged 3 Layer Tea, Gula Melaka, Healthy, Jicama, Nyonya, Nyonya Delicacies, Palm Sugar, Pie Tie, Popiah, Street Eats, Vegetarian. Bookmark the permalink. wow I like the 3-layered ice team and pie tie. I don’t think pie tie has a dessert version, but given an creative and imaginative spin anything goes! I’m thinking julienned apples with chopped oranges and raisins inside the little hats. What do you think? haha, too bad! I can’t usually reject anything with a little sugar.julienned apples with chopped oranges and raisins…wow it’s gonna be fruity and yummy. Is that for your snack or lunch? Just an idea. Need to find those cutesy hats first.